Metro PCS Communication is an American mobile service provider, formerly known as General Wireless. The company was established by Roger D. Linquist in the year 1994 as General wireless with its headquarters in Richardson, Texas, US. Metro PCS Communication operates the fifth largest telecommunication services in the United States, with about 3,600 employees to provide mobile service to about 9.5 million subscribers in and around the stated of US. The wireless service provider offers its phone network for customers without any long term annual contracts, provides plans with big saving such as monthly unlimited usage, a nationwide coverage. There are currently 0 consumer reviews about Metro PCS Communications available. Share your review. 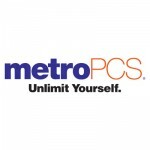 Please take a note that you are about to post a public review about Metro PCS Communications corporate office on CorporateOffice.com. This review will be public, so please do not post any of your personal information on this website. If you would like to contact the corporate offices of Metro PCS Communications, please use their contact information such as their phone number, website, and address listed above to contact them. However, sometimes staff from Metro PCS Communications headquarters do read the reviews on this website.